Award-winning trompe l'oeil mural depicting the spirit of the community. This project forever transformed a concrete bridge into an illusion of an old, ivy-covered stone bridge. 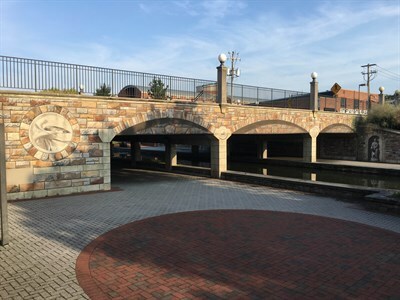 Nice easy stroll in Frederick, take in a concert or eat at one of the restaurants along the canal. Beer garden and black hog come to mind.